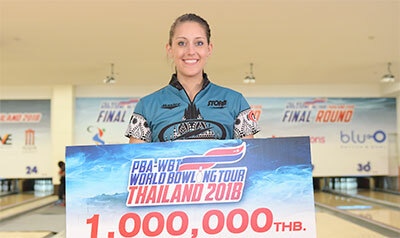 28th September, Bangkok: Topseed, Danielle McEwan of Stony Point, N.Y., defeated third-seed, Stuart Williams of England, 225-179 in the second deciding match to win her second WBT title at the 2018 PBA-World Bowling Tour Thailand. McEwan get off well with three strikes-in-a-row in the final as Williams could only respond with a double and then suffered an early split in the third which he failed to convert into a spare. The American also suffered a split in the third frame but the Brit recovered with five-in-a-row thereafter. Although McEwan managed another double in the fifth and sixth frames, she stumbled to another split in the seventh frame. She did manage another double in frames eighth and ninth, but Williams struck out to win the first match, 232-218 to force a decider. McEwan steadied herself with two spares and a strike in her first three frames while Williams sagin had an early split in frame two. The 27-year-old champion of the 2018 PWBA Fountain Valley Open, converted a crucial split in the fourth frame as her challenger suffered another split in the fourth. Whilst the Brit recovered with a double in the sixth and seventh frames, McEwan made sure that she made clean shots to eventually end the match with 225 to earn a well-deserved victory. McEwan's first WBT title came two years ago in Doha, Qatar winning the H.H. Emir Cup defeating Bahrain's Yousef Falah. "Considering I had come close in a few tournaments these past few months, I'm extremely happy to have come off with this victory here in Bangkok," said McEwan after receiving the top prize of 1 million Thai baht (approx. US$32,260) as champion. "I had a good line to bowl and had plenty of strikes in the first match but then again I also had plenty of splits. But in the second match, I quickly settled into a good rythmn and made sure I make no mistakes." Williams, who picked up the second prize of 500,000 baht (approx. US$16,130), had earlier edged second-seed and winner of Round 3 finals, Rafiq Ismail of Malaysia, 206-205 in the semi-finals. The Malaysian had looked certain of beating Williams but ended the tenth frame with a split. The first runner-up also edged fourth-seed, two-handed Kyle Troup of Taylorsville, N.C., 182-173 in the quarter-finals to move up the ladder. In the second stepladder match, Troup had tied with winner of the first match, Sin Li Jane on 220 but won the one-ball roll-off with a strike against Sin's 9 pins on their third ball. Fifth-seed Anthony Simonsen managed only 178 in the match. Sin breezed past seventh-seed, Sean Rash of Montgomery, Ill., and eighth-seed, Yannaphon Larpapharat of Thailand, 261-195-246 to advance to the next match. Ismail took home 300,000 baht (approx. US$9,680) as second runner-up, Troup 200,000 baht, Sin 100,000 baht, Simonsen 90,000 baht, Yannaphon 85,000 baht and Rash 80,000 baht. 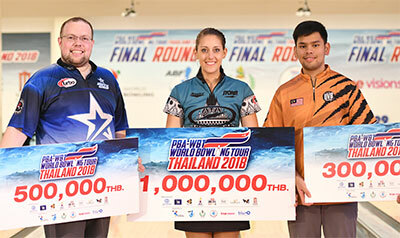 A total of 133 players from 27 countries participated in the sending 2018 PBA-World Bowling Tour Thailand. Players required three series of three games each with multiple re-entries to qualify. A total of 42 bowlers qualified for the finals divided into four rounds of finals to reach the Final TV Shootout.